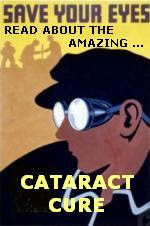 Dual Use of a Wide-Angle Lens in "The Concrete Captain"
* Depict the subjective POV of a person who's drugged, drunk, tired, or insane. * Depict the subjective POV of an unnatural creature (e.g., a ghost, alien, demon). * Suggest an ominous, alien, or supernatural presence or situation. * Photograph everthing in small rooms or tight spaces (low-budget films can rarely afford to rent a professional studio in which the camera has enough space to pull back to photograph a scene). But especially admirable is when a filmmaker achieves more than one aesthetic effect from a wide-angle lens. Such an application may be referred to as being aesthetically efficient. It is because of its aesthetic efficiency that I admire this shot from "The Concrete Captain," an episode from TV's Ghost Story/Circle of Fear. 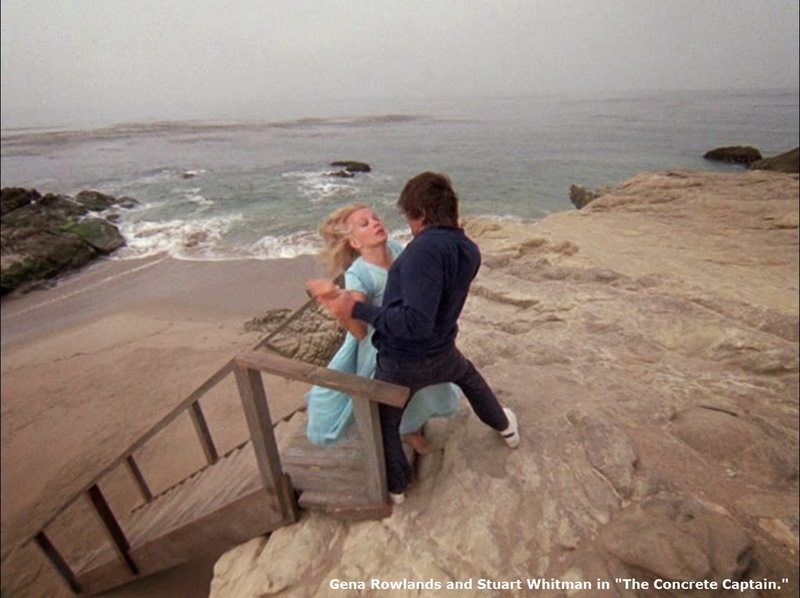 In the above scene, a ghost possesses Gene Rowlands, compelling her to come out to the beach. Her husband, played by Stuart Whitman, catches up and tries to bring Rowlands back to the motel. They struggle at the top of some stairs. The wide-angle lens in this scene achieves two effects. * First, the lens's distortion of space suggests a supernatural presence (i.e., the ghost possessing Rowlands). * Second, the lens' expansion of space makes the stairs appear that much higher above the ground. This makes the consequences of falling down those stairs appear that much more dire, thus heightening viewers' tension as they watch Rowlands and Whitman struggle. For more about the use of lenses in horror films, see Horror Film Aesthetics: Creating the Visual Language of Fear. This blog represents a continuing discussion of my views on horror, picking up from where the book left off. One of the film director's jobs is to stage the actors -- to instruct them on where to sit or stand, where to look, when to notice each other, etc. Staging is a fine art, the search for a delicate balance. It's rarely a good idea to over-direct the actors, directing their every smile, frown, head tilt, eyebrow lift, shift in tone of voice. 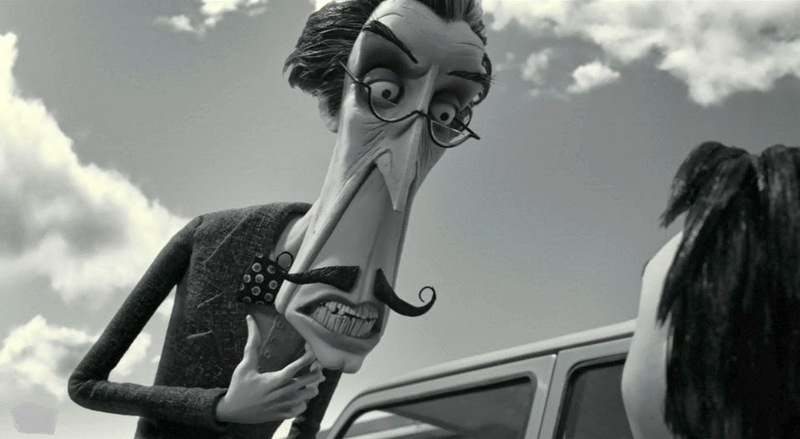 Then the actors feel like constrained marionettes, denied the freedom to "find their character." But neither is it a good idea to just dump the actors on set, and leave them milling about, without any instruction or direction. This is especially true if one is working with amateur actors, because they lack the training to behave appropriately without direction. Evidence of a Haunting, yet another fictitious horror film about "true-life TV ghosthunters," provides an instructive example of inept staging. We then cut to this (above) shot of a father and his two daughters, standing like mannequins in the hallway, doing nothing very much. Apparently the director placed them in the hall, because soon the doorbell will ring, so they must be prepared to open the door. How does this family know the ghosthunters are soon to ring the bell? Were they standing in the hall for the past several hours, just waiting for the doorbell to ring? I also love how the father has his eyes closed, the older daughter slouches while smirking and staring at nothing much, and the younger daughter looks bored. Well, of course she's bored. You'd be bored too if you spent your evenings standing in a hallway waiting for someone who is expected to arrive sometime over the next several hours. As for the older daughter, I suppose she's smirking because she's so excited to be in a movie. It's anyone's guess why the father fell asleep. Now the doorbell rings, bringing the father and older daughter to life. The younger daughter is a little late to react. Perhaps this shot is taking a long time to finish. Young children bore easily. Amateur child actors are no exception to this rule. Even so, the younger daughter comes alive in time to lean in unison with her family, as everyone prepares to see who's out there. The family that leans together stays together. 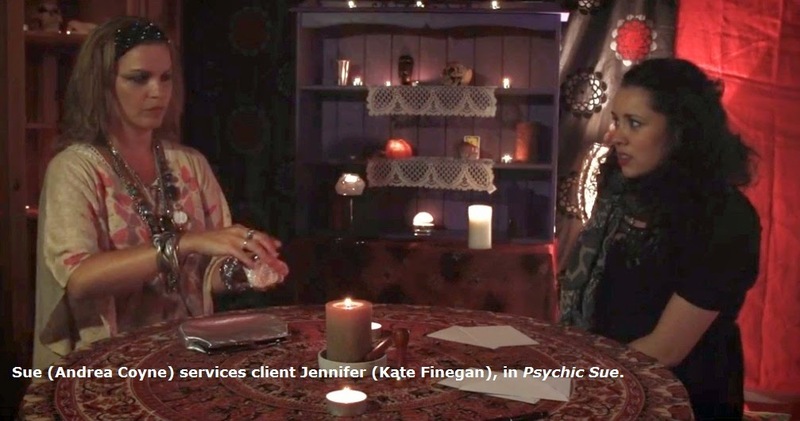 Captions now also provide their names, identifying them as our ghosthunters' clients. And our ghosthunters are outside! They enter and everyone exchanges the usual banal pleasantries. This shot is poorly staged, poorly directed, and poorly edited. * A better alternative is for the actors to have been staged off-camera, as if they were busy living their lives elsewhere in the house. 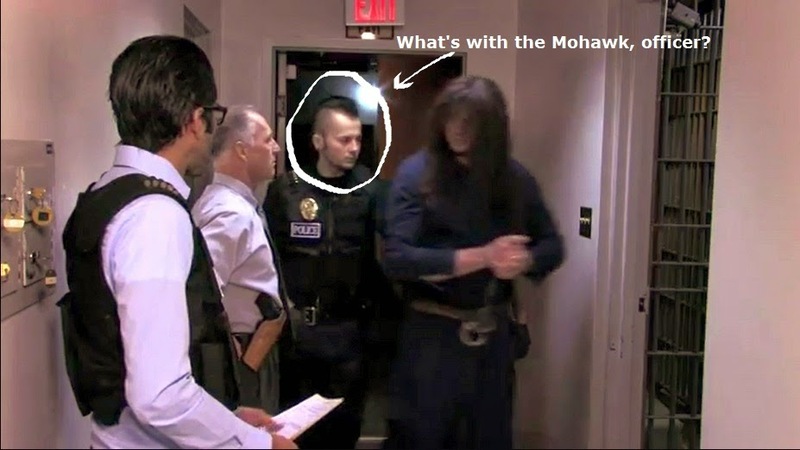 They should have entered the hallway only after the doorbell rings. * Even better if only one of them enters the hall to open the door. Otherwise it's a light bulb joke. How many clients do you need to open a door? Three. One to turn the knob and two to lean over and watch. * Another alternative would have been to delete this shot entirely. Why not just cut to an exterior shot of the house, followed by our ghosthunters already interviewing the clients inside the house. It would have quickened the pace. As it is, this shot is not only poorly staged, it is superfluous, in that it doesn't add anything necessary to the film. * At the very least the director should have trimmed this shot so that we don't see the family waiting in the hall, the father asleep. Perhaps the actor was only resting his eyes, or blinking. It's a brief moment. Even so, the director should have caught it in the editing room and trimmed the shot. The film's editor also bears blame. 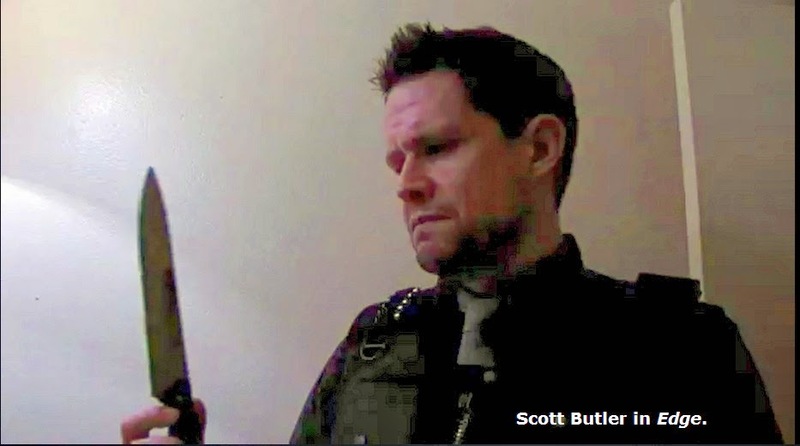 Evidence of a Haunting has many problems. This shot is just a sample. The film is poorly written, ineptly staged, and performed by a cast of amateur wannabe-actors. 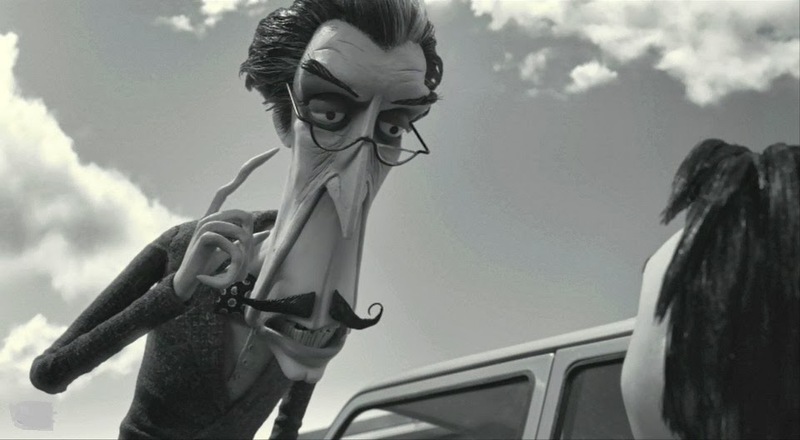 But I can forgive bland dialog and amateurish acting if a film is entertaining. Evidence of a Haunting is not. It's boring. For an example of good horror staging, see my post about "Legion of Demons." 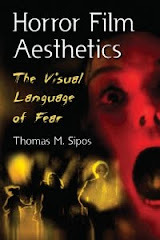 For more information about staging and editing in horror films -- see Horror Film Aesthetics: Creating the Visual Language of Fear. This blog represents a continuing discussion of my views on horror, picking up from where the book left off. A long-running debate in horror film criticism is the merits of explicit vs. implied threats. Which packs the greater emotional punch? To see gore in all its graphic detail, or to leave such horrors to our imagination? 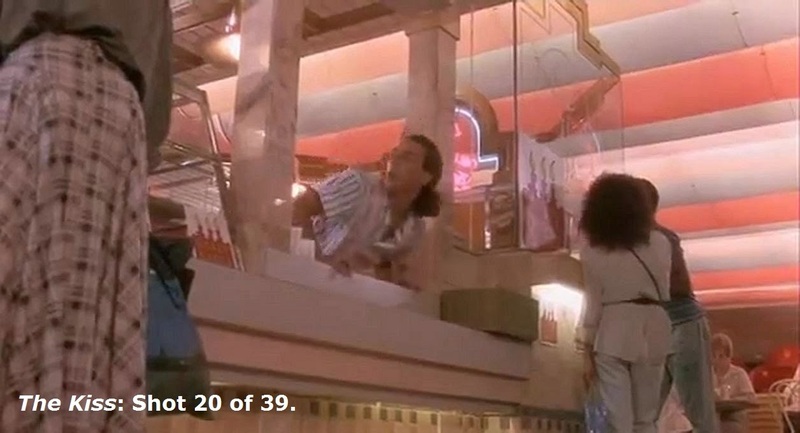 The Kiss (1988) provides an excellent example of the power of implied gore, in a scene that is set at a department store. The scene comprises 39 shots, running a total of 1 minute, 19 seconds. 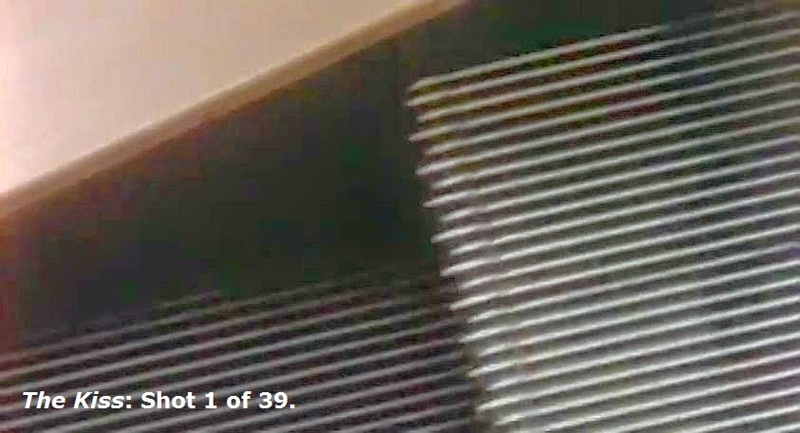 The scene opens with three closeup shots of escalator stairs, from different angles. Two teenage girls step onto the escalator, Amy (Meredith Salenger) and Heather (Sabrina Boudot). As they rise with the stairs, Heather realizes that she's dropped her lipstick. She returns to the bottom of the stairs to retrieve it. As she reaches for it, her necklace is caught by the escalators. Naturally, Heather is unable either to extract the necklace from the stairs, or to remove the necklace from around her neck. There follows an increasingly tense series of shots. Heather rising with the stairs. Amy looking on in horror, screaming for help, unable to help Heather. Amy's boyfriend, Terry (Shawn Levy), who works at the store, hears Amy. 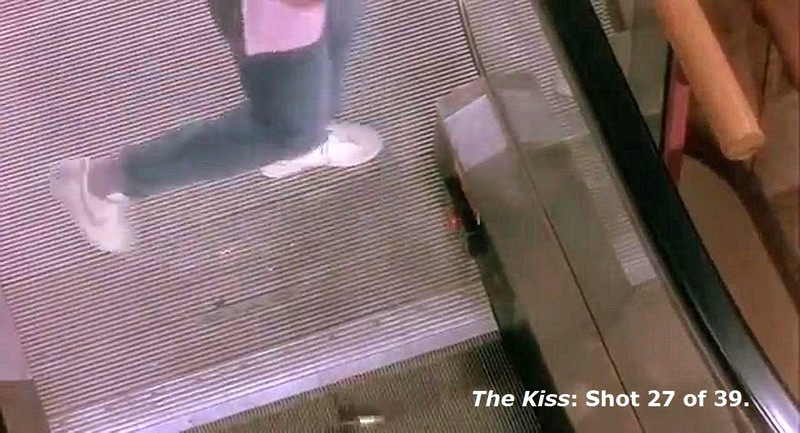 He rushes to the escalator. He kicks the Emergency Stop button, but to no avail. The escalator won't stop. 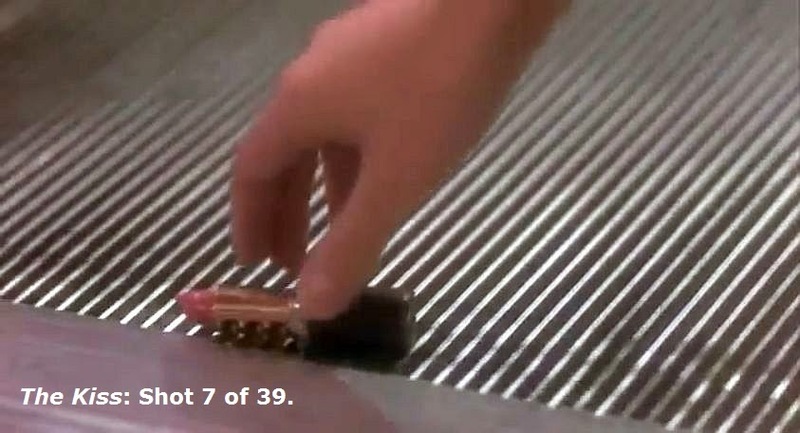 As the scene progresses editing heightens our sense of panic through brief, quick cuts of the same few shots -- Terry's frantic kicks, Amy's horrified gaze, the moving escalator stairs -- and Heather's screaming face, the necklace wrapped ever more tightly across it. Viewers, morbidly tantalized, fearfully anticipate what will happen to Heather's face when she reaches the top of the escalator. 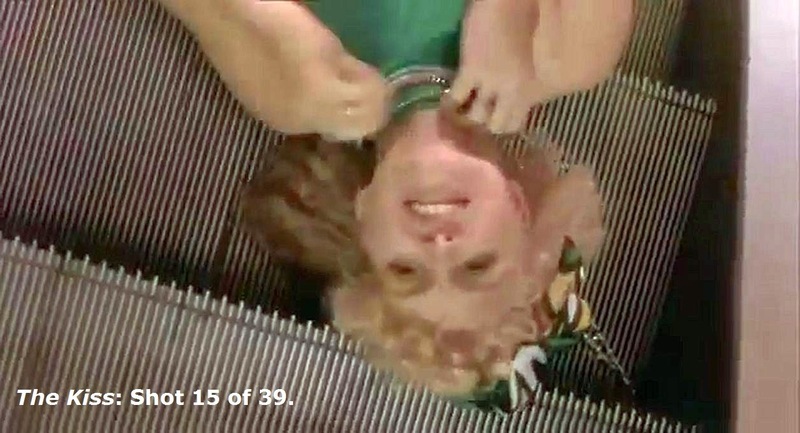 But when Heather does arrive, the penultimate shot of is Amy's horrified gaze -- then a final shot of the escalator stairs, still running smoothly as blood, hair strands, and necklace bits collect at the top. 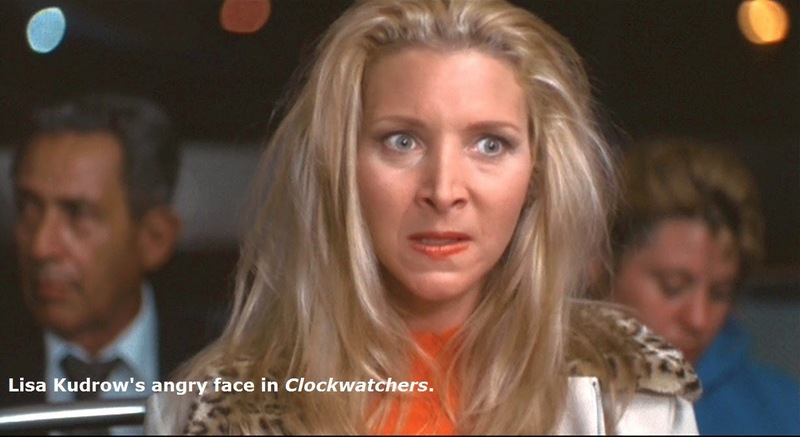 What happened to Heather is left to our imagination. Instead, we cut to a scene of a distraught Amy arriving home. We learn that Heather is in the hospital, "badly cut up." We never see or hear of Heather again. Her face -- or what's left of it -- is forever left to our imagination. This scene's dramatic setup and editing do much to build audience tension. 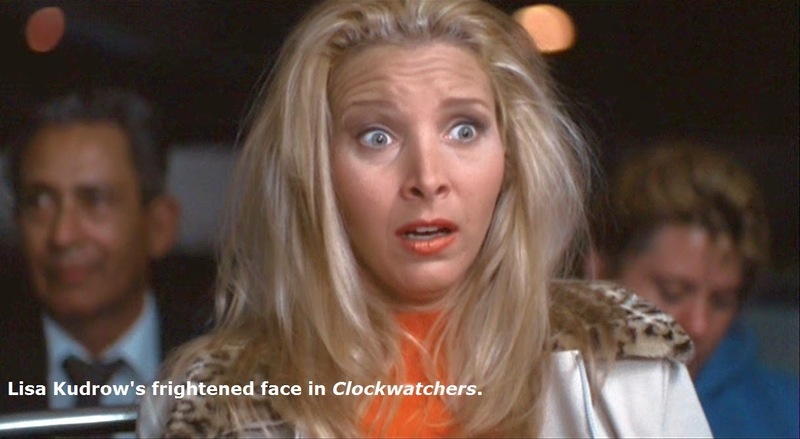 So much so that our minds filled in the blanks as to what occurred to Heather's face. Some filmmakers would feel the need to push the envelop and show the flesh tearing off from Heather's face, perhaps in slow motion. 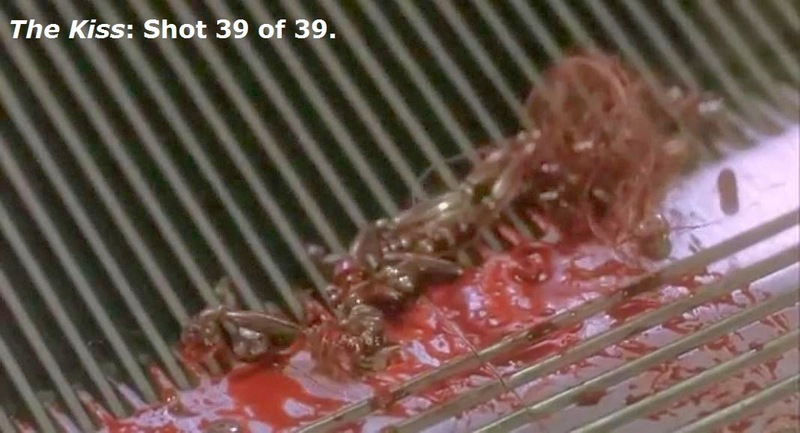 Some films have indeed shown humans being skinned alive (e.g., Dagon). Yet The Kiss's handling of this scene is also extremely effective in instilling suspense and horror. For more about the use of offscreen space in horror films, see Horror Film Aesthetics: Creating the Visual Language of Fear. This blog represents a continuing discussion of my views on horror, picking up from where the book left off.